Click image to enlarge Altoona, Washington, as seen from the Altoona-Pillar Rock Road. Image taken October 15, 2013. 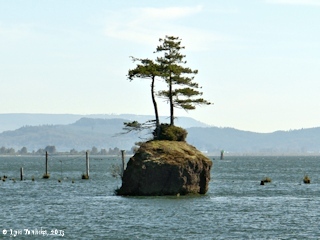 Altoona, Washington, is located east of Grays Bay, at Columbia River Mile (RM) 24. Downstream (west) is the now-forgotten fish receiving station known as Cottardi Station, and 1/2 mile downstream is Harrington Point, the eastern point of Grays Bay. Three miles upstream is Pillar Rock and the Pillar Rock Cannery, while ten miles upstream is the small community of Skamokawa. Offshore from Altoona lie the Miller Sands, once a productive fishing grounds. 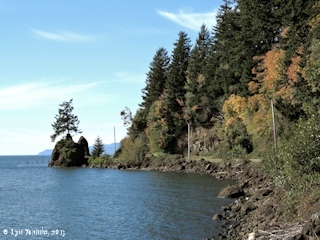 In the early 1900s Altoona was one of six fish-buying stations and canneries operating withing a six-mile stretch of the Columbia River in the Grays Bay area. 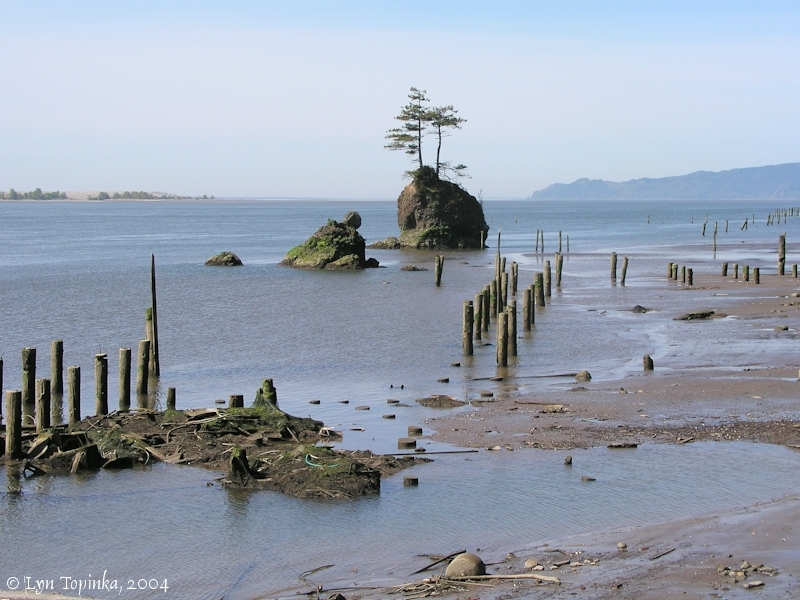 Eventually before the decline of the salmon industry, 39 canneries would line the banks of the lower Columbia River. Altoona was also a major stop for steamers traveling between Astoria and Portland. "... Lewis and Clark came to the area of Skamokawa on November 7, 1805 and, according to their diary, found a village of seven indifferent houses in the area where they purchased a dog, some fish, wappato, roots and two beaver skins for making a robe. In Curtis' "The North American Indian" the Indian name for the village is given as Chahulklihum, or Winter Town, and as Altoona was known as Chaquayalhum, or Summer Town it is reasonable to assume that the Wahkiakums camped in Skamokawa in the winter and moved to Altoona in the summer. The supposition that Altoona was inhabited in summer by the Wahkiakums is borne out by the Wilkes "Narrative". 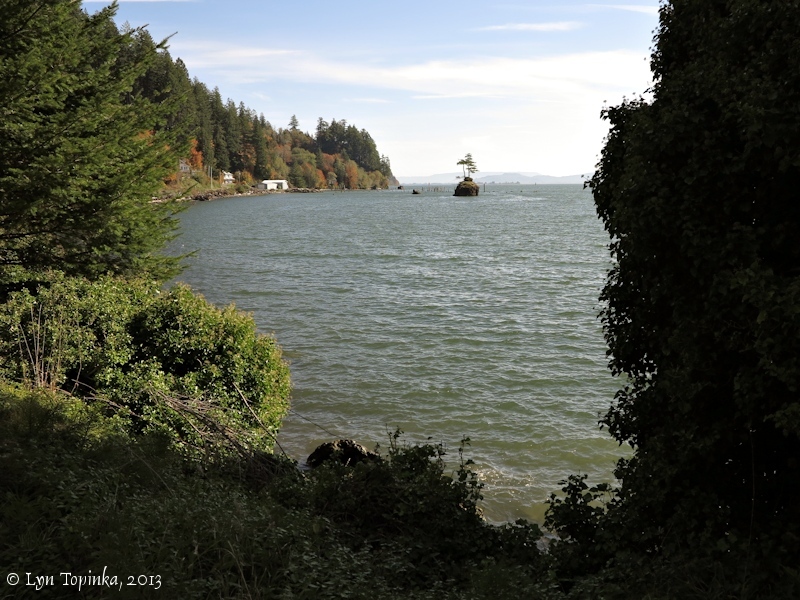 In the early 1840s a chief named Skamokawa had his main lodge there when the Wilkes expedition visited. ..."
In the 1830s the Altoona site was used by the Hudson's Bay Company as a fish receiving station and saltery. 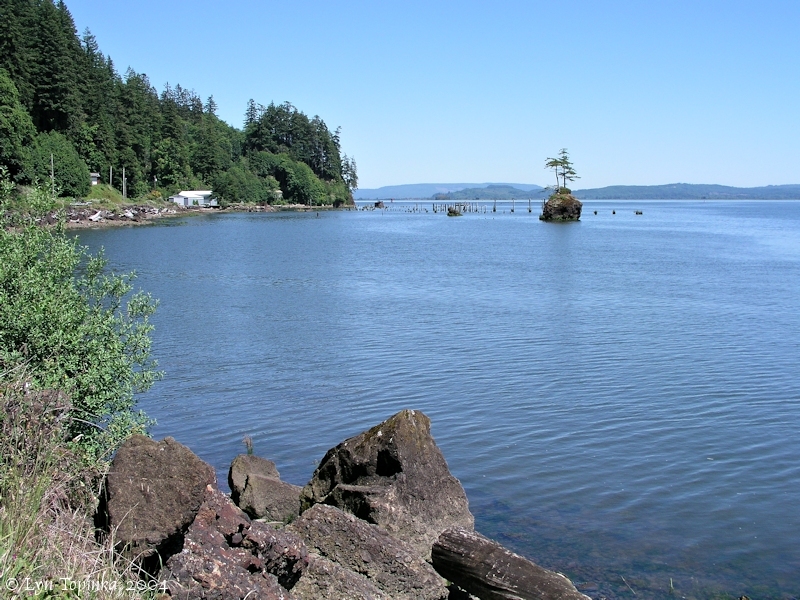 In the early 1890s Miller Sands (the shallows offshore from Altoona) provided good salmon seining grounds. 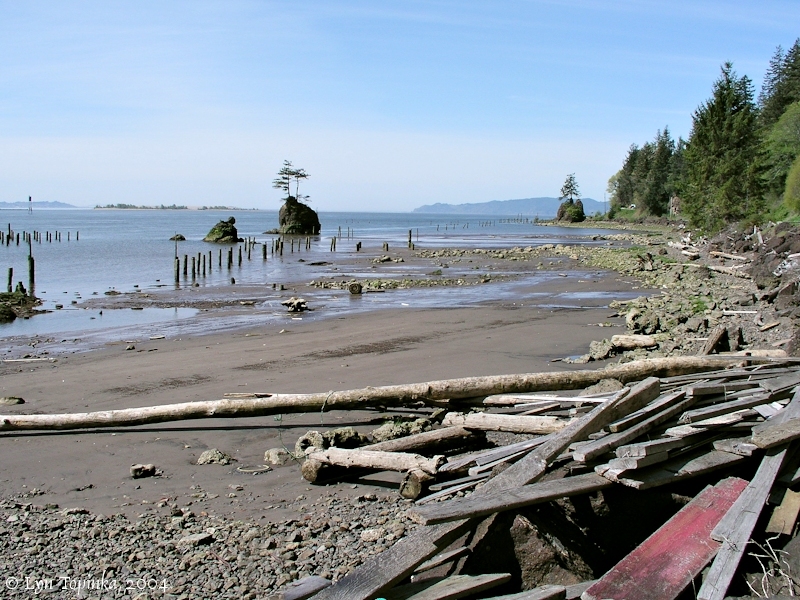 William Hume, long-time fish entepreneur opened a fish-receiving station. In 1903, Hans Peterson (originally an employee of Hume) logged 830 acres of property at the station, named the new community "Altoona" (after his home town of "Altona", Germany, a major fish-processing city on the Elbe River) and began the Altoona Mercatile and Fish Company Cannery. By 1910 the Altoona Cannery ranked fourth among the Columbia River canneries. A fleet of 25-foot sail-rigged gillnet boats operated out of Altoona fishing at night, when nets were invisible to the salmon. In 1907 the Columbia River Packers Association (CRPA) purchased Cottardi Station, located less than 1/2 mile downstream from Altoona, where they built a receiving and weighing station. In 1935 the CRPA moved its headquarters to Altoona after purchasing the financially failing Altoona Packing Company. In 1947 with the decline of the Columbia River salmon industry, the Altoona Cannery closed. 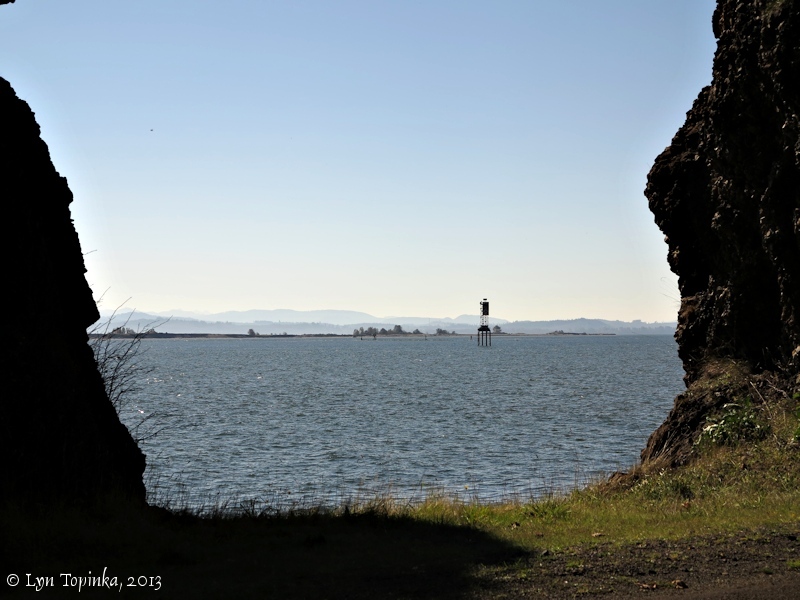 The cannery building however remained as a reminder of the once thriving Columbia River salmon industry. In crashed into the Columbia in the late 1990s. 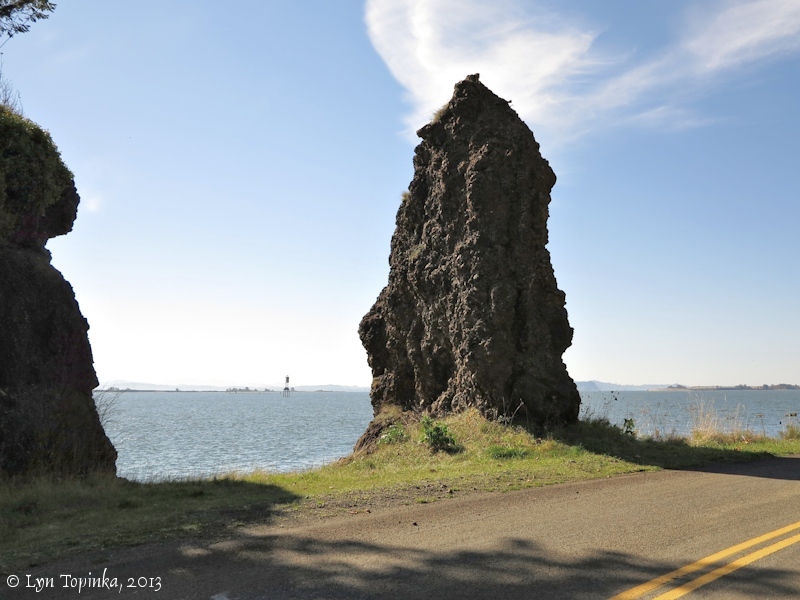 Click image to enlarge Sign, Altoona-Pillar Rock Road, Washington. Image taken October 15, 2013. Click image to enlarge Altoona, Washington. Image taken October 15, 2013. 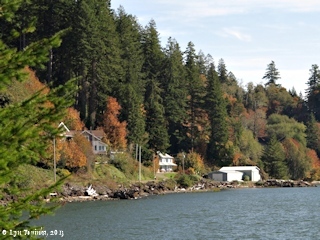 Click image to enlarge Altoona, Washington, view upstream. Looking towards location of the old Altoona Cannery. 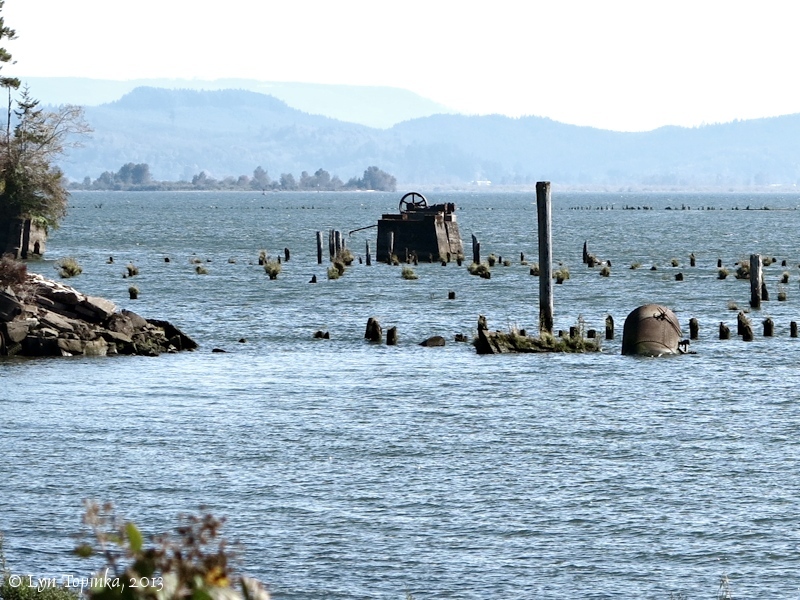 In the late 1990s the cannery came crashing down into the Columbia River. Image taken June 16, 2004. 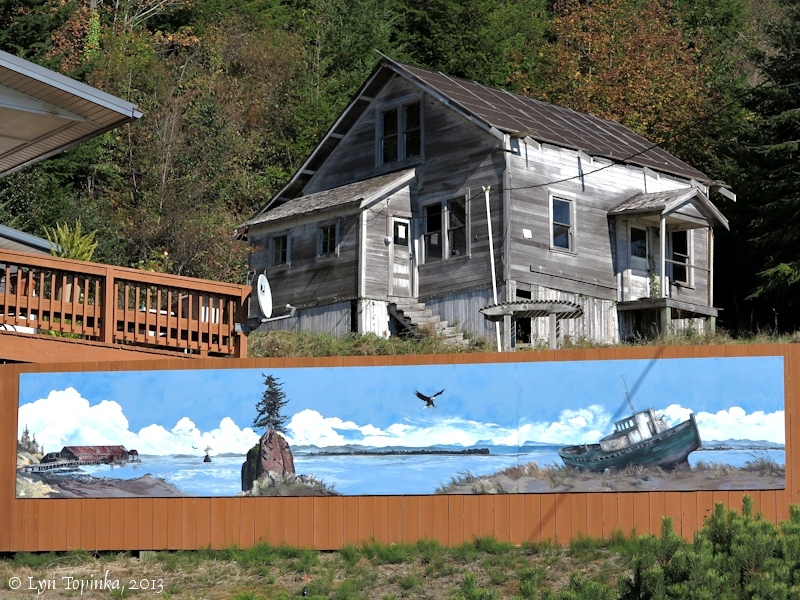 "The Altoona Cannery was operated as "Hume Station" by owner William Hume who built a salmon receiving station at this location in 1890. In 1903 the Altoona Mercantile and Fish Company was incorporated by Hans Peterson, a German immigrant. The Altoona Packing Company was formed one week later. The cannery continued operations until 1947. In 1980 the property was owned by Daniel Stephan. 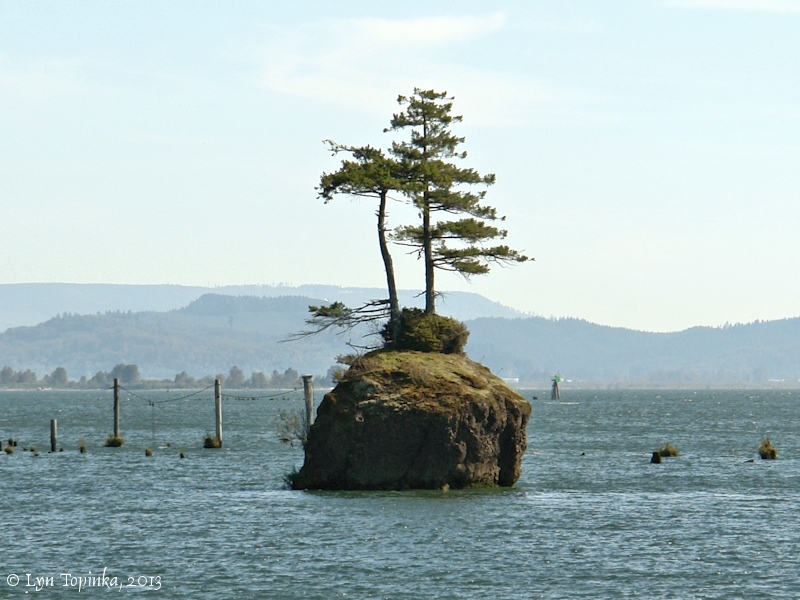 In the late 1990s the cannery came crashing down into the Columbia River." Source: Washington Rural Heritage photo archives website, 2011. Click image to enlarge Altoona Cannery location, Altoona, Washington. 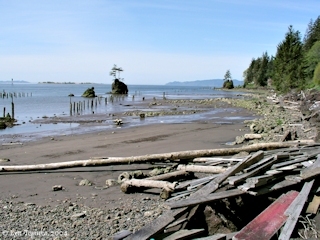 Image taken April 9, 2004. Click image to enlarge Columbia River panorama from Altoona, Washington. Image taken October 15, 2013. 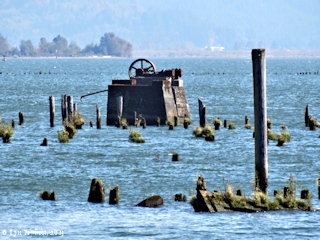 In 1978, Altoona's "Columbia River Gillnet Boat" at the Altoona Cannery was added to the National Register of Historic Places (Structure #78002783) as an important part of the fishing industry along the Columbia River between 1900 and 1924. The 26-foot-long double-ended boat was built between 1913 and 1916 and was one of the first of the gillnet boats built for a gasoline engine. Today the Gillnet Boat is located at the Wahkiakum County Fairgrounds. In October 2013 a mural of the Columbia River was found on fence at the location of what once was Cottardi Station. 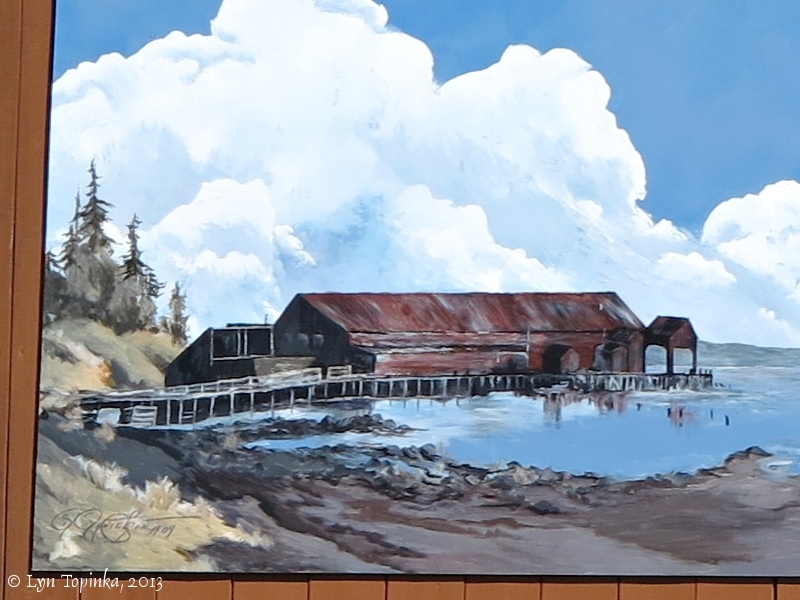 The mural shows the Altoona Cannery, the basalt pillars in the Columbia, and a grounded Gillnet boat. Cottardi Station was located less than one-half mile downstream of Altoona. [p.29, and p.29 footnote] ... "Another important event of 1905 was the arrival of a wealthy German packer who was interested in a mild cure operation and cold storage -- Frederick Klevenhusen. 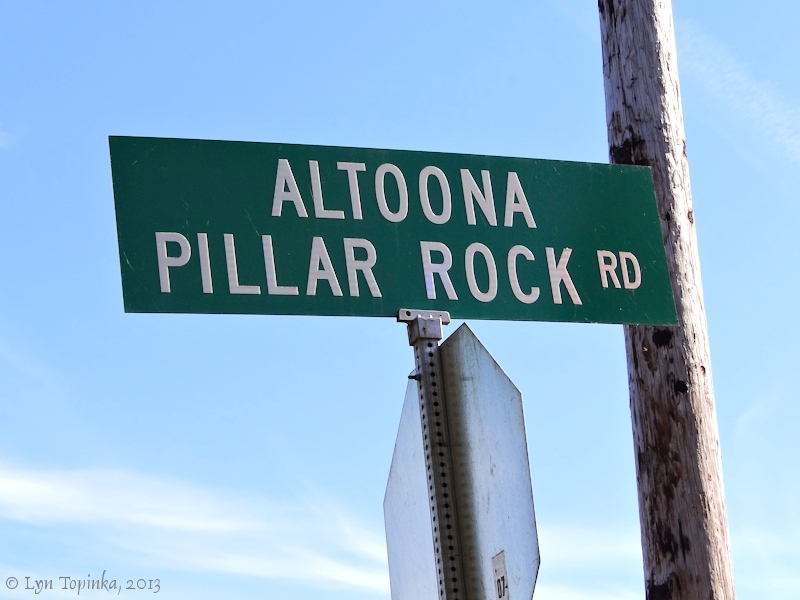 ... Hans and Nellie Petersen of Altoona sold a parcel of land (1.48 acres) in Lot 3, Sect. 15, including docks and water rights to Frederick Klevenhusen, Sr., Frederick Klevenhusen Jr., Friedrich Wilhelm Klevenhusen and Conrad Klevenhusen, Partners, doing business a F. Klevenhusen & Co. signed in the presence of J.O. Bailey and Martin Both." [p.71] ... "[The] Klevenhusen Cold Storage plant at Altoona [was] destroyed by fire on May 6, 1932. It had been taken over several months earlier by Astoria Savings Bank to settle the estate of the late Mr. Klevenhusen and renamed the Pacific Fish Co. It was being prepared for operation on a lease basis by Max Pudich and Max Berg. The building and equipment was valued at $40,000 but had only $14,000 insurance covered by the Astoria Savings Bank receivership. 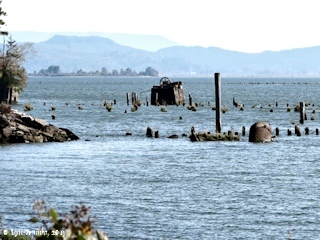 The remains of the piling and engine are still visible at Altoona today." [p.78] ... "The big Altoona event in 1932 occurred on May 6 when the Klevenhusen cold staorage and receiving station burned leaving a large number of piling and a picturesque old boiler and engine. It was known as Pacific Fish Co., and was under lease to Max Pudlich and Max Berg. The latter was living in Ft. Bragg, Calif. and Mr. Pudlich was in New York on his way to Astoria following a visit to Germany." [p.78, footnote] ... "[The cold storage plant] had been taken over several months earlier by Astoria Savings Bank to settle the Klevenhusen estate. A.H. Olsen was the bank appointed receiver in charge. The plant was valued at $40,000. One diesel engine, a steam engine, considerable cold storage equipment, several nets, and the building were all lost when it burned to the line of piling. There was $14,000 in insurance." Source: Carlton E. Appelo, 1972, "Altoona". Click image to enlarge Klevenhusen Cold Storage Plant remains, Altoona, Washington. Image taken October 15, 2013. Click image to enlarge Miller Sands (brushy area in distance) as seen from Altoona, Washington. Image taken October 15, 2013. Click image to enlarge Altoona pillar, Altoona, Washington. View from Altoona-Pillar Rock Road. 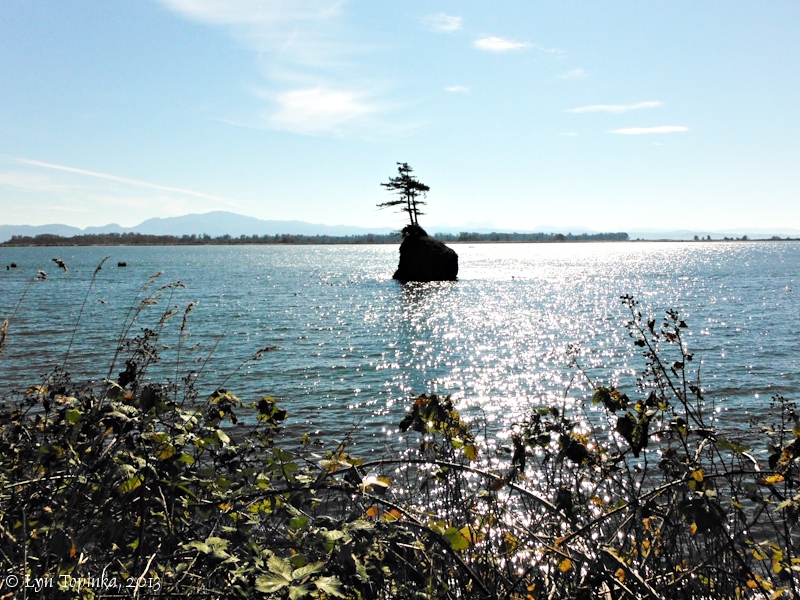 Image taken October 15, 2013. 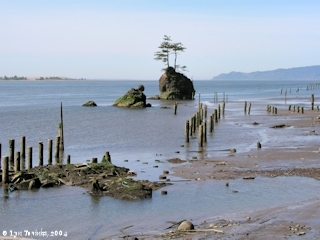 Click image to enlarge Pillars located downstream from Altoona, Washington. View from Altoona-Pillar Rock Road. Image taken October 15, 2013. Click image to enlarge Miller Sands (brushy area in distance) as seen from west of Altoona, Washington. View from Altoona-Pillar Rock Road. Image taken October 15, 2013.